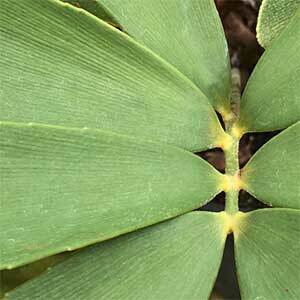 A cycad with different foliage to many, Zamia furfuracae makes an excellent plant for many landscaping applications. Sometimes called the ‘Cardboard Palm’ because of the texture of the foliage. The foliage is rounded and pinnate, and does have sharp spines. leaflets are a mid green with a felt like ocher coloured underside. Originally from Mexico through South America including Venezuela, this is an understory plant that grows in tropical rainforests. Slow growing, it is often sold as an indoor plant, however over time it will be best suited to a large container or better still outdoors. Growing from a tuberous root, over time these will form stems or short trunks creating a very interesting multi trunked plant. The large root system stores water so Zamia furfuracae is reasonably drought tolerant as long as it is in a shaded position. A humus rich soil or potting mix, well drained and a position in light shade are the major requirement for good growth. An application of a general purpose slow release fertilizer in early spring and again in late summer is generally sufficient for indoor plants. Both the flowers and the seeds are poisonous. It is a plant that will grow in light shade however it does require some water during dry summers. Major problems are related to over watering, this can lead to fungal problems and death of the plant. Growth Habit – Matures to a multi trunked bushy clump. Water – Water during active growth, restrict water during winter. Landscaping Uses – Specimen plant, excellent understory plant in a tropical garden. Zamia furfuracea can also be grown indoors. Pruning – Generally not required, old dead foliage can be pruned away. Propagation – From fresh seed.